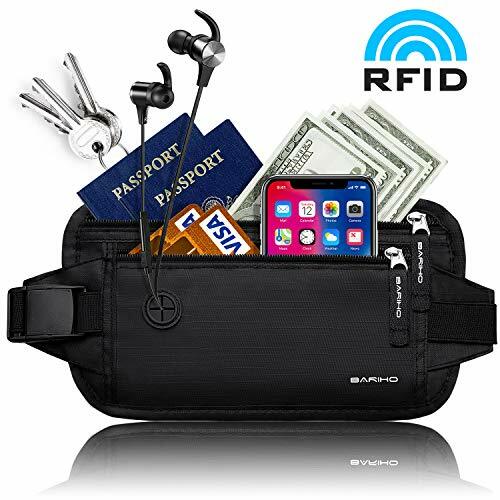 ▶1.FASHION AND USER-FRIENDLY DESIGN: It's not only a Running Belt, but also a chic and stylish Travel Money Belt. It comes with smartphone pocket specially, and also a pocket with a key buckle, furthermore there are two pockets with zipper. Equipped with a moisture absorbing mesh panel at the rear provides a sweat resistant, non itch feel. ▶2.BUY NOW WITH CONFIDENCE: If for any reason you are not satisfied with our product you will receive a full refund no questions asked and hassle free. 100% Money Back Guarantee. Ideal Passport Holder for men & women with Blocks RFID Transmissions Function. ✔Elasticized strap fits both women and men. 【100% Waterproof Premium Material】Material of top quality provides exceptional density and lightness, 210D rip-stop Nylon with RFID Blocking technology offers premium protection to your belongings. 【Thinnest and Lightest to go】Foolproof protection for your cash, keys, credit cards, ID cards, your passport, mobile or iPhone, preventing from thieves and identity theft, this wallet is designed to be thin and light to compact your valuables at ease. 【Easily Stored and Organized】This wallet has two close fitted zipper bags to offer highest protection. The one behind is a larger to hold your phone, jewelries, ear phones and other accessories. The front one is a smaller which can fit your cards and passport, easy for you to fetch or organize. 【Perfect Gift for Travelers】Are you still worried about what's the ideal gift for traveling family and friends? This bag is THE Answer. Give them this practical and fancy gift which names fashion itself. Action better than words. Take it home right away. 【Guaranteed with 1 Year Warranty】 The BARIHO travel Money Belt Wallet is suitable for men, women and children. We provide your with risk-free purchase with a one-year warranty. If you're dissatisfied, simply return the product within 1 week free of charge. Our after-sale service guarantees you to buy at ease, use at ease. If you have any questions about this product by BARIHO, contact us by completing and submitting the form below. If you are looking for a specif part number, please include it with your message.